The definition of value or quality with respect to work in translation has historically been a particularly vexed issue. Today, however, the growing demand for translations in such fields as technology and business and the increased scrutiny of translators' work by scholars in many disciplines is giving rise to a need for more nuanced, more specialized, and more explicit methods of determining value. Some refer to this determination as evaluation, others use the term assessment. Either way, the question is one of measurement and judgement, which are always unavoidably subjective and frequently rest on criteria that are not overtly expressed. This means that devising more complex evaluative practices involves not only quantitative techniques but also an exploration of the attitudes, preferences, or individual values on which criteria are established. 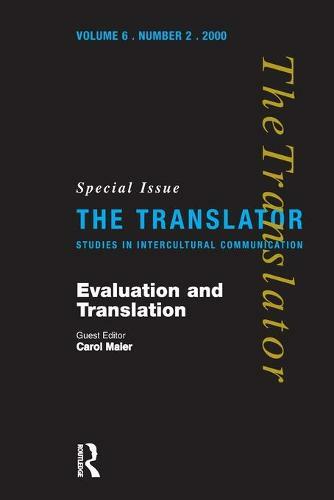 Intended as an interrogation and a critique that can serve to prompt a more thorough and open consideration of evaluative criteria, this special issue of The Translator offers examinations of diverse evaluative practices and contains both empirical and hermeneutic work. Topics addressed include the evaluation of student translations using more up-to-date and positive methods such as those employed in corpus studies; the translation of non?standard language; translation into the second language; terminology; the application of theoretical criteria to practice; a social?textual perspective; and the reviewing of literary translations in the press. In addition, reviews by a number of literary translators discuss specific translations both into and out of English.